A protein that is naturally present in the brain reduces laboratory animals' attraction to environments in which they have experienced cocaine's effects. The recent finding could point the way to new treatments to help people overcome addiction to cocaine and perhaps to other drugs. Dr. Collin Kreple, Dr. John Wemmie, and colleagues at the University of Iowa and U.S. Department of Veterans Affairs Medical Center, Iowa City, previously showed that the protein, called acid-sensing ion channel 1A (ASIC1A), supports some types of learning and memory. In a new NIDA-supported study, they found, to their surprise, that ASIC1A exerts an opposite, inhibiting effect on cocaine-related learning and memory. These contrasting effects suggest that medications that increase ASIC1A might block the formation of powerful drug-context associations that promote cocaine use and relapse, while leaving intact—or even improving—other kinds of memory. Figure 1. ASIC1A Dampens Animals’ Preference for Cocaine-Related Environments After receiving cocaine in a distinctively marked chamber, mice spent more time in that chamber than in another where they had not received the drug. This preference was less strongly marked in mice with normal ASIC1A (blue bar) than in mice that were genetically modified to lack ASIC1A (ASIC-knockouts, red bar). When researchers restored ASIC1A to near normal levels in the nucleus accumbens (green bar), the animals exhibited place preference similar to that shown by normal mice, and less than that shown by unrestored knockouts. The results suggest that ASIC1A may limit vulnerability to cocaine relapse by making the brain less sensitive to drug-related learning and rewards. The researchers repeatedly exposed mice to cocaine in a distinctively marked test chamber, and then gave the animals a choice: They could hang out either in that chamber or in another where they had not received cocaine. Normal (“wild-type”) mice and mice that were genetically altered to lack ASIC1A both favored the chamber where they had received cocaine, and spent the majority of their time there. However, the normal animals exhibited this preference less markedly (see Figure 1). The finding suggested that ASIC1A inhibits the pleasure obtained from taking cocaine or the learning processes required to associate that pleasure with the environments in which it is experienced. To further establish the link between ASIC1A and drug-related behavior, the researchers injected the protein into the nucleus accumbens (NAc) of the genetically altered mice and repeated the chamber-preference test. With their ASIC1A levels thus raised to near those of wild-type mice, the genetically altered animals now spent less time in the cocaine-associated chamber than did a control group of still-ASIC1A-deficient mice. This observation confirmed that that protein exerts a dampening effect on cocaine-seeking behavior. The researchers then turned to another animal, the rat, to assess ASIC1A’s effect on cocaine reinforcement. In these experiments, rats self-administered 30-milligram doses of cocaine in test sessions that took place before and after the researchers increased ASIC1A in their NAc. The animals self-administered less cocaine in the second session, after they received the ASIC1A supplement, indicating that the protein reduces the drug’s reinforcing effect. The researchers concluded that, in animals, ASIC1A suppresses two important drivers of cocaine addiction and relapse: cocaine reinforcement and drug-association learning. Moreover, raising ASIC1A levels in normal animals can strengthen these effects. Drs. Kreple and Wemmie were surprised by their results. They had expected to find that ASIC1A strengthens, rather than weakens, cocaine reinforcement and cocaine-related associations. Such findings would have paralleled previous observations by the two researchers and others that ASIC1A promotes some types of learning. For example, ASIC1A promotes associations between fearful experiences and the places where they were experienced. Similarly, normal animals solve the Morris water maze, a test that requires them to remember spatial relationships, more readily than ASIC1A-deficient animals. These differences were all consistent with ASIC1A in the NAc limiting cocaine reward and inhibiting cocaine-related learning and memory. An increase in dendrites, as seen in the ASIC1A-deficient mice, has been linked to animals’ increased preference for environments that they associate with cocaine. 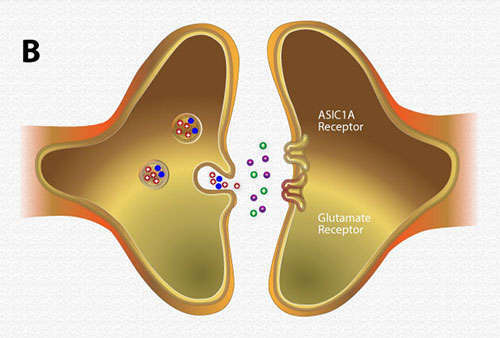 Alterations in glutamate receptor quantity and composition such as those seen in the ASIC1A-lacking mice have been associated with enhanced responsiveness to the drugs’ reinforcing effects. These receptor changes also have been shown to underlie memory associations linking rewarding experiences to the places in which they occur. In further experiments, Dr. Wemmie and colleagues added detail to our understanding of ASIC1A’s activity and effects on neurons in the NAc. These investigations identified a likely starting point and mechanisms for ASIC1A’s effects on NAc neuron structure and responses to cocaine. Previous research had shown that ASIC1A is present on neurons throughout the brain. The protein resides on the neuron postsynaptic membrane, which is the part of the neuron surface that receives excitatory and inhibitory signals from neighboring neurons. The ASIC1A lumen opens and allows calcium ions to pass from the neuron exterior to the neuron interior when the pH of the surrounding environment is low (i.e., acidic). However, the exact circumstances that trigger ACIS1A activation, and how the resulting changes in ion flow affect the neuron, remained unknown. Dr. Wemmie and colleagues hypothesized that free protons activate ASIC1A, based on two premises. First, other researchers had reported that when a presynaptic “sending” neuron releases neurotransmitter, it also releases free protons into the synaptic space between itself and the postsynaptic “receiving” neuron. Second, free protons lower pH in tissues. The researchers confirmed their hypothesis by using tissue slices from the core region of the NAc of normal mice. In these experiments, they monitored electric current in postsynaptic neurons while stimulating release of neurotransmitters from presynaptic neurons. By bathing the tissue slices in compounds that block postsynaptic currents arising from other sources, the researchers isolated a small current that was attributable, by process of elimination, to activated ASIC1A. This current occurred concurrently with the release of the neurotransmitter glutamate from the presynaptic neuron. It was absent in NAc core tissue from ASIC1A-deficient mice, but appeared when the researchers chemically added ASIC1A to the tissue. Presynaptic neurons in the NAc core release glutamate and, simultaneously, release protons into the synapse. 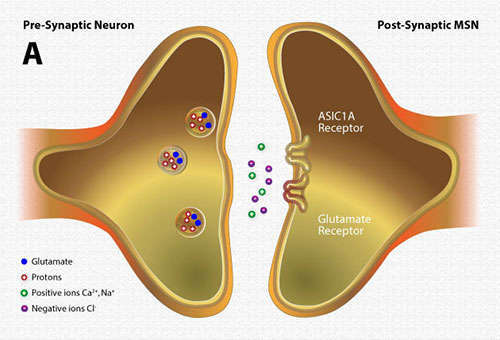 The glutamate and protons activate glutamate receptors and ASIC1A, respectively, on postsynaptic medium spiny neurons. Positive ions flow through the activated glutamate receptors and ASIC1A. The positive ions induce electric current in the postsynaptic neurons, with about 95 percent of the current contributed by the glutamate receptors and about 5 percent contributed by ASIC1A. The current induces mechanisms inside the neurons that, ultimately, result in structural differences that inhibit behavioral responses to cocaine (see Figure 2). Panel A: Vesicles in presynaptic neurons contain the neurotransmitter glutamate and protons. The synapse between the presynaptic neuron and postsynaptic medium spiny neuron (MSN) is normally at a slightly alkaline pH. Panel B: When the presynaptic neuron is stimulated, the vesicles release their contents into the synapse. Panel C: The released protons lower the synaptic pH. 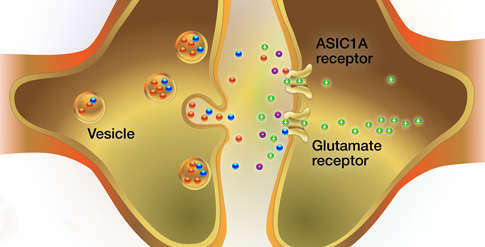 Panel D: Glutamate binds to and activates glutamate receptors on the postsynaptic MSN in the nucleus accumbens. The receptors open and allow positive ions (Na+ and Ca2+) to enter the cell. In the presence of low synaptic pH, protons bind to ASIC1A, allowing further influx of positive ions into the cell. Panel E: As positive ions build up within the cell, they induce a strong electric current. The current and buildup of Ca2+ initiates a cascade of intracellular events leading to structural changes that blunt the cell’s responsiveness to cocaine reward and cocaine-associated memories. This work was supported by NIH grant DA034684. NIDA. "Protein Diminishes Cocaine Reward and Cocaine-Related Learning in Animals." National Institute on Drug Abuse, 5 Feb. 2016, https://www.drugabuse.gov/news-events/nida-notes/2016/02/protein-diminishes-cocaine-reward-cocaine-related-learning-in-animals. NIDA. Protein Diminishes Cocaine Reward and Cocaine-Related Learning in Animals. National Institute on Drug Abuse website. https://www.drugabuse.gov/news-events/nida-notes/2016/02/protein-diminishes-cocaine-reward-cocaine-related-learning-in-animals. February 5, 2016.